Rev. 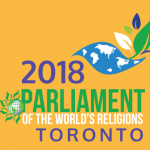 Anne will share some of what she learned from attending the Parliament of the World’s Religions in Toronto. The theme this year is “The promise of inclusion, the power of love.” Religious leaders from across the globe will speak on our need for interfaith connection and inclusion, which can only be realized by people who seek change based on love’s incarnation in life itself.